Camping is among the most popular and loved outdoor activities. Some people love it for it brings them closer to Mother Nature; others love the relaxation it provides after escaping from the hustle and bustle of the city, while others do it for recreation. Whichever the reason for going out camping, it’s vital to ensure you enjoy the maximum satisfaction. The camping tent is one of the essential equipment. It provides a good shelter, protects you from the elements, and also keeps you warm and cozy in any environment. Nevertheless, not every tent will offer the desired service. Some will be a bit bulky and cumbersome to carry, others are not waterproof and not UV protected, while some may be a bit small or little large. This review will not only guide you on selecting the best but also outlines the top items currently on offer. Understanding the different types of tents helps you to choose the right one for your and your family or friends. It forms an apex/ A-shaped when viewed from the side and this is because of the two poles on the two end sides. Most come with a tarp for added protection against the weather. Although they are pretty portable, lightweight, and easy to install, they aren’t designed for use in very strong windy conditions. It looks similar to the traditional A-Frame tent but the difference is it is curvier on its edges. Rather than using two straight poles at the end, this tent relies on curved poles that increase the interior space. It’s also more stable and most come with a full coverage rain fly that replaces a tarp. 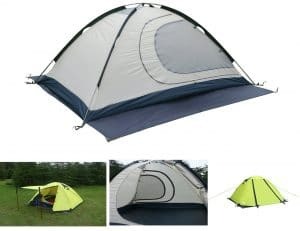 This is a basic tent that is designed for a single or two users. It features a single curved pole that supports the canopy and material. It is a popular choice for backpackers, cyclists or couple because it is easy to setup, occupies minimal space, and is very portable. The downside is that it isn’t large enough for many users and cannot shield from the very strong winds. Instead, on straight poles at the end, this tent relies on curved poles. Two joined poles form an arch that supports the canopy. Usually, a small to medium tent will feature three arches, two at each end and one at the center. Guy rope, pegs, and stakes are used to improve its stability. This tent is loved for its spacious nature and easily slide off snow, rain, and ice. It, however, requires more time and effort to setup. Tunnel tents are known for their spacious nature and good stability even in strong wind condition. They comprise of the fabric that is supported by two or more poles that run along the structure’s width. They, however, are not compact and need to be pitched with the ends facing the oncoming winds for maximum stability. Dome tents are famed for their spacious nature, good coverage, and versatility. Small types can accommodate a single user or couples, medium types for more than two users, while large ones can fit a family or a group of people. They consist of several poles, some running across in the roof sections and a large canopy. Some come with dividers for demarcating different rooms and porches for storing equipment and gear. Advantages of dome tents include good space, good coverage, weather-friendly, and stability. What Are the Important Features of a Camping Tent? Workmanship: You are advised to only go for tents from reputable manufacturers who are known for high-quality workmanship. 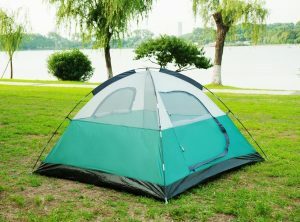 Such tents will be made out of high quality and strong materials and will also be backed by a manufacturer’s warranty. This theNORTHblu pop-up tent is a perfect for 2 adults. It’s perfect for camping backpacking, hiking, and many other outdoor expeditions. It’s made from 190T polyester fabric that provides longevity and reliability while the 3 ventilation holes allow for more air circulation. It also features a mosquito net to protect you from any kind of insect. Fiberglass poles and sturdy hook stakes give a great support for the tent. Campers, hikers, and other users love the easy setup, easy carrying, quick setup, and quality construction. The simple-looking tent unfolds and folds easily and can be fitted inside the included carry bag. The ZOMAKE tent comes in a pop-up design for easy assembly and disassembly and is supported by durable fiberglass poles. The 2 windows, 2 doors and skylight improve lighting and ventilation whereas the UV protection ensures the occupants are protected from harmful ultra-violet rays. This lightweight tent weighs about 5 pounds and folds down to a smaller for easy carrying. It’s a good buy because it’s well-made, durable, easy to open and fold, and also affordable. 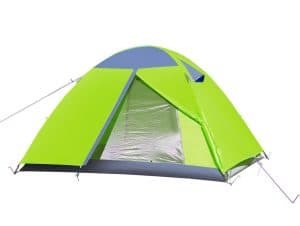 You and your family or friends will find this blue and green tent by Camp Solutions a worthy investment. It measures 11 feet long, 9 feet wide, and can accommodate up to 6 people. 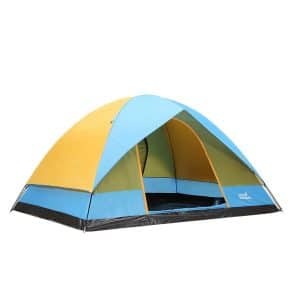 The colorful tent comes with a 190T polyester fabric and is supported via shock-corded fiberglass poles. The dome tent has multiple grommets for easy attachment to poles and comes with UV protection layer. Consumers like its quick setup and removal, fast pitch system, quality material, and construction. The SEMOO camping tent is famed for its large door that provides easy entrance and exit. The fairly large tent can accommodate up to 3 adults. The 3-season tent is suited for summer, spring, autumn and the canopy is made from strong and durable Polyester with Polyurethane (PU). The interior is made of Polyester Polyamide (PA); the floor is made from Polyethylene (PE) while support pole is given by the Fiberglass poles. 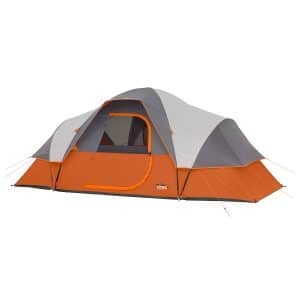 It is a popular choice because it offers good rain protection, spacious, easy to setup, windproof, and affordable. 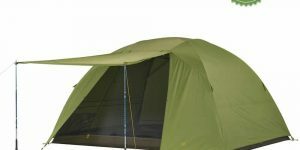 The green Techcell tent is ideal for camping, hiking and backpacking. 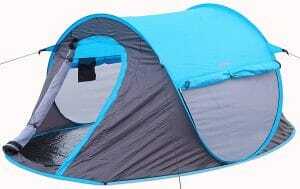 The sturdy and nice looking tent can accommodate up to 3 people and comes with double doors for easy access. The double-layer material improves the strength and stability of the tent while the breathable polyester fabric promotes a good internal environment. The rainproof tent will keep you dry and warm even in the rainy weather while the simple design makes attaching a mosquito net easy. Its advantages include good functionality, quality material, easy to setup, and comfortable fabric. Your outdoor activities are more comfortable and convenient when owning the Coleman Sundome tent. 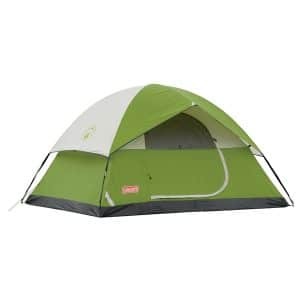 Targeted at many users including campers, backpackers, and hikers, this tent can accommodate up to 4 people. The tent features a large rear hooded window providing a good airflow and the mesh vents on the roof provides additional ventilation. The canopy is made from a high-grade polyester fabric while the poles are constructed from fiberglass. The tent floor is made from 1000D polyethylene bathtub for durability and leak proof. The ShinyFunny family tent can comfortably accommodate 3-4 people. 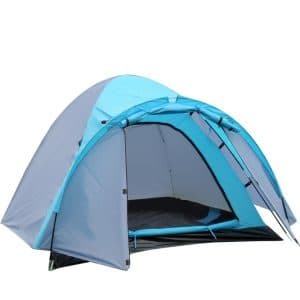 It is made of waterproof taffeta polyester fabric, quality steel pop-up poles, and sturdy steel stakes. The lightweight and spacious tent is fit for backpacking hiking, camping and traveling. The tent contains the large zippered “D” door using velcro for easy entry and exit. A storage pocket is attached inside the tent so that you can keep small objects such as keys, wallet, and cell phone. Its key merits include easy to setup, good portability, quality material, and spacious. 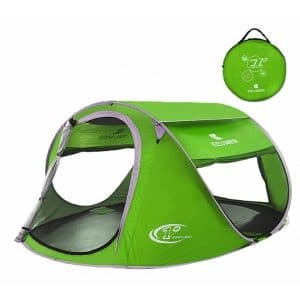 This extended dome tent by CORE Equipment is targeted at big families or a large group as it is designed up to 9 people. The big tent can comfortably fit 3 queen-size mattresses and comes with a lantern hook and side pockets for better storage. The CORE H20 Block Technology together with the fully taped rainfly and sealed seams, which give a full water-resistant and protect the campers from moisture and water. The mesh ceiling allows the good air ventilation that makes this tent is a great choice for all season. The center height of 6 feet so that you can walk and stand in the tent easily. For better storage, the tent feature a mesh for putting your gear and item on the tent’s wall. The Luxe Tempo tent is perfect for camping, backpacking, and hiking among other outdoor activities. Constructed from sturdy and highly-breathable 210T polyester, you will feel like the natural environment while staying inside the Luxe Tempo tent. The meshed roof and high-low ventilation give additional air circulation whereas the double-layered design improves its strength and durability. The 3000mm PU coating together with rip-stop fly prevents rain and moisture while the 2 vestibules offer a large storage space. It’s a good choice because it’s well built, roomy, strong material, and durable. 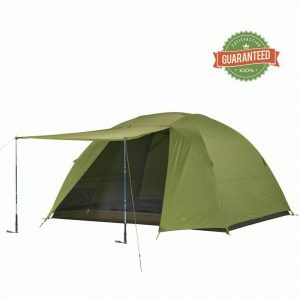 Known for its quick and easy setup, the Slumberjack Daybreak tent is very popular. It’s a top pick for inexperienced and also experienced campers, backpackers, and hikers. This premium quality tent can fit up to 6 adults and is made from high-grade polyester. Support is provided by the easy-to-erect fiberglass poles and steel stakes. Carrying and/or storing the folded tent is easy and convenient courtesy of the included carry bag. It’s worth buying because of its solid nature, simple installation and removal, spacious design, and long life. Some people state that the steel stakes are a little thin. Camping is without a doubt one of the most rewarding recreational activities. Lately, the number of campers has been rising as they seek to take advantage of the activity. Nonetheless, to have the ultimate experience, you need to invest in a proper tent. It should offer good protection against the weather, climate, animals, and UV. The accessory should be easy to setup, bring down, carry, and store. It should also come in decent dimension, weight, material, and design.